We look forward to seeing you at Fox Farm! 803-356-4052 (must include area code when dialing) or email foxfarmsc@yahoo.com . Please make sure you contact us to make an appointment before visiting so that we can accomodate you. We stay very busy most Saturdays and only have extra staff available to show you around our activities during specific times of the day. 1. Can we bring treats for the horses? Sure, the horses love apples, carrots and sugar cubes. Our other farm animals will enjoy the extra treats if you are interested in feeding them also. A staff member will be happy to help you. 2. Is there a refrigerator and freezer available? Yes; just let us know when you arrive and we'll be happy to keep things cool for you. 3. How many picnic tables are available in the picnic shelter? There are three 6foot long picnic tables under the shelter. There are two additional tables available for presents or serving food. Let us know ahead of time if you need more and we will try to accommodate. 4. Can parents ride the horses? Sure; either with a child or on their own. 5. Can we bring our own food if we do not want to do the weenie roast? Yes, you are welcome to bring any food, drink or decorations you want. Please do not bring confetti as part of your decorations. 6. Can we come early to set up? You are welcome to come 15minutes prior to the start of your party to set up. If it is light rain or drizzle we can still complete all of our activities. (As long as you don't mind getting a little wet.) If there are scattered showers we can try to rearrange our activities to work around the showers if possible. But, if it is a storm or heavy rain there isn't a whole lot we can do since all of our activities take place outdoors. If you prefer not to get wet, let us know as soon as possible so we can either reschedule or cancel. 8. Do you have a grill? Yes, we do have a grill available for rent for $5. Make sure you tell us if you want to use the grill when you reserve your party. 9. What is the layout for a basic birthday party? 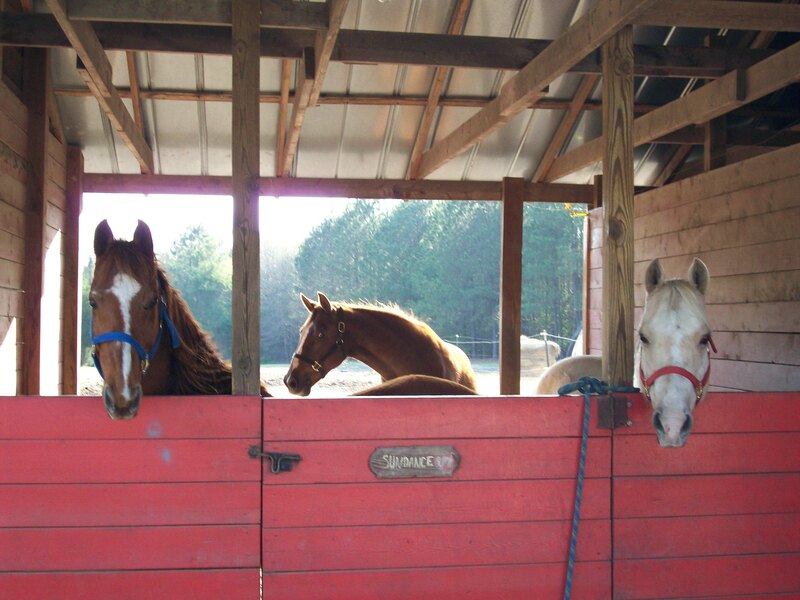 Parties begin with 30-40 minutes of horse rides, followed by a hay ride and a visit to our petting zoo. These activities typically take no longer than 1hour 15minutes. The remaining time is for you to do cake, gifts, etc... at the picnic shelter. Parties are scheduled for 2 hours. Please try not to exceed 2 hours as we usually have other parties scheduled to use the picnic shelter later in the day. 10. What if we need extra time for our party? You must let us know when you reserve your party that you want extra time. The cost is an additional $30 per 30 minute increment you wish to add to your party time. If you do not tell us when we reserve your party another group will probably be scheduled to begin right behind you. We can always shorten our activities by a few minutes if you need extra time at the picnic shelter. Just let us know! We will be as flexible as possible without imposing on other parties on the farm. 11. Why don't you plant flowers with the flower pot painting activity any more? We no longer operate our nursery so we do not have flowers available for planting. 12. Can we bring our family to visit the farm? Yes, Please call or email us to set up a time to come visit if you are interested in bringing your family. Unfortunately if you show up and we are not expecting you we may not have staff or time available to show you around the farm. Our animals stay in their pasture when we do not have groups scheduled to visit and are not available to be pet or fed by the public at other times. The cost is $6.00 per child for a horse ride, hay ride, and visit to our petting zoo. Horse rides are only available on Saturdays. We are only open on Saturdays, unless you are visiting during the week with a group who has scheduled a visit in advance with us. 14. What times do you offer parties on Saturdays? We offer parties at 10:00, 11:00, 12:30, 1:30, 3:00 and 4:00. We are not open on Sunday. Sorry, no we do not offer any discounts. 16. What days of the week are you open? We offer birthday parties on Saturday mornings and afternoons. We are closed on Sundays. We are open during the week for groups (minimum of 10kids) who wish to come out for a field trip. You must schedule your trip with us in advance (foxfarmsc@yahoo.com) because we only have staff available when a group is scheduled to visit the farm. Horse rides are not available on weekdays unless specifically requested by a group when the field trip is scheduled. 17. When do we need to pay? Please pay the $30 deposit when you confirm and reserve a date/time for a party with us. This ensures that your party date/time is saved for you. If your deposit is not received within 7days of booking your reservation will be cancelled. We will notify you when your deposit is received. If you are do not receive notification or have questions please contact us asap. You can pay the rest of the payment on the day of your party. If you are with a school group, mom's group, etc...(not a birthday party), you can pay your full payment on the day of your event. 18. Do your animals stay in the small enclosures they are in all of the time? No, all of our animals seen in a small pen (sheep, bull, horse, donkey and llama) are only there when we have visitors on the farm. They all stay in a larger fenced in area when the farm is not open. 19. Are your animals vetted? Yes, all of our animals are regularly vetted. 20. Is there a minimum or maximum number of attendees at a birthday party? There is no minimum or maximum; you may bring as many or as few people as you like. Unfortunately, when groups arrive late it inconveniences the groups that follow. In an effort to provide the best field trip possible for all, we have had to institute ‘late arrival fees’ as stated below. To schedule a trip – Please call us at 803-356-4052 or via e-mail at foxfarmsc@yahoo.com . Check the Map/ Directions page to view directions to Fox Farm. 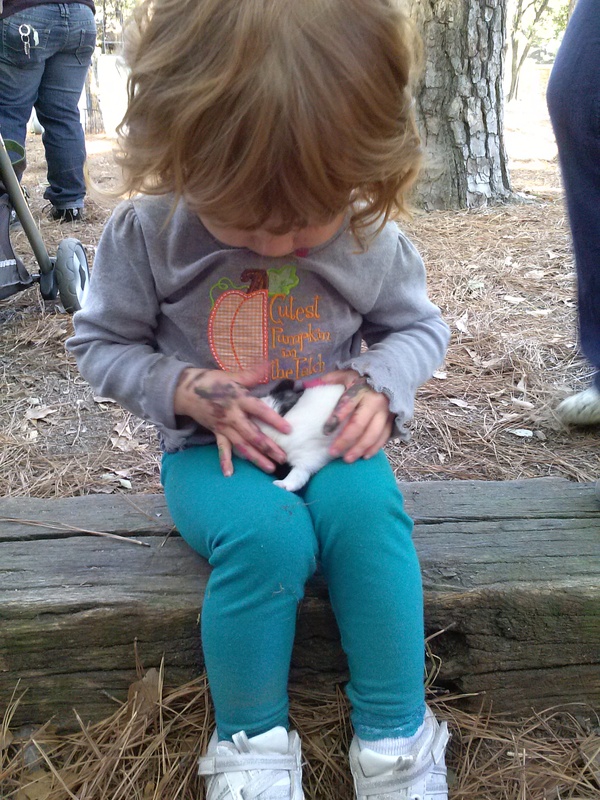 Even kids as young as one or two years old can participate at Fox Farm. Thank you for visiting our web site! Come see us on the farm!